HKCSS set up the Social Enterprise Resources Centre, produced the first Social Enterprise Directory in Hong Kong and organized a series of training courses and activities. Submitted a proposal on advancing social enterprise to the Commission on Poverty. Proposed to the Chief Executive on enhancing policy support to social enterprise. The Chief Executive incorporated 'Social Enterprise' as one of the major initiatives of his Policy Agenda. Joined hands with Wanchai District Council to organize the first "Social Enterprise Marketplace" in pedestrian zone of Causeway Bay. Over 40 social enterprises participated in the event. Jointly funded by the Hongkong Bank Foundation and the Social Welfare Department's Partnership Fund for the Disadvantaged, HKCSS officially established the HKCSS – HSBC Social Enterprise Business Centre was launched. Launched various services such as "Social Angels Programme" and "SE Incubation Scheme". Received funding support from Li & Fung (1906) Foundation Limited and the Partnership Fund for the Disadvantaged to set up the Hao Hao SE trading platform which assists SEs to expand business network. Co-developed the "Social Impact Assessment Tool" (SIAT) with McKinsey & Co. to objectively measure the financial and social return of social enterprises. Facilitated the set up of the Hong Kong General Chamber of Social Enterprises and served as the Secretariat at the Chamber's start up stage. Won the "Outstanding Partnership Project Award" of Caring Company Scheme. Successfully incubated "Happy Veggies" and helped a number of organizations in applying SE start-up grants. Started up ACT Social Awareness Network to organize social experiential learning activities for raising awareness of SE's value and social issues. SEBC is awarded Caring Company Scheme “Outstanding Partnership Project Award" 2009/10 (Partner: The Hongkong and Shanghai Banking Corporation Limited). Subsidized by Home Affairs Department in developing SE Guide iPhone apps and SE search engine to further enhance interaction with customers. Received funding from Trade and Industry Department to launch "So-Biz" project for promoting barrier-free consumption. Sponsored by Power Assets Holdings Limited and the Partnership Fund for Disadvantaged, we set up the first social enterprise concept store "Good Goods", located at the lobby of HKCSS headquarter, to promote sustainable consumption. Outstanding Partner of Social Enterprise 2013 (Partner: The Peninsula Hong Kong). SEBC is awarded Friends of Social Enterprise. SEBC, Good Goods, So-Biz are awarded Gold Award of Web Accessibility Recognition Scheme 2014 (Website). So-Biz is awarded Gold Award of Web Accessibility Recognition Scheme 2014 (Mobile Application). Good Goods is awarded Top Organic Retailer Award – Quality Organic Retailer Award. "Travel for Good” is nominated for "The 7th Hong Kong Book Prize". Appointed by Commissioned by the Social Enterprise Advisory Committee (SEAC) , SEBC and Chinese University of Hong Kong conducted a research on the current landscape and development of social enterprises in Hong Kong, published (The Report of "The Research Study on the Social Enterprise Sector in Hong Kong"). Manage and operate the rst-in-town social enterprise lifestyle hub – GOODPOINT preserved from a heritage building. As an Intermediary of the Social Innovation and Entrepreneurship Development Fund (SIE Fund), the Hong Kong Council of Social Service (HKCSS) launches the Impact Incubator, a one-stop supporting platform with a mission to bring positive social impact through incubating social entrepreneurs and bridging social capital. Organized GoodFest @ GoodPoint, over 1000 people joined. SE Good Start - "A Practical Guide of Setting up a social enterprise" and "Choosing a Legal Form and Recommended Practices" was published. 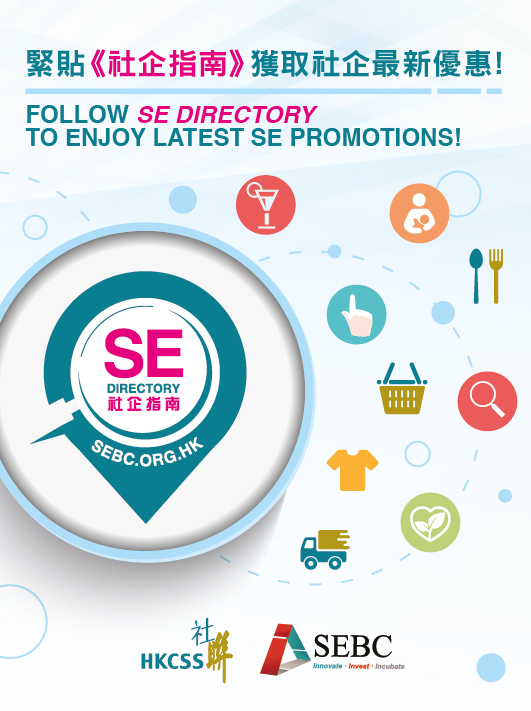 Upgrade of SE Directory smart phone application and online search engine, featuring a location-based search function.